In contrast to their optimism regarding the new Obama administration, Latinos offer a largely negative assessment of the Bush administration as it comes to an end. Even though President George W. Bush won 40% of the Latino vote in 2004 (Suro, Fry, Passel 2005)—a high for a Republican presidential nominee in recent elections—more than half (54%) of Latinos now expect that his failures will outweigh his accomplishments. Just two-in-ten (19%) Latinos state the opposite. 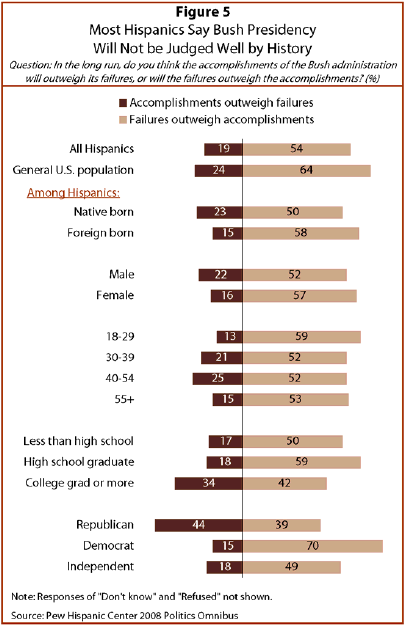 Though critical of Bush, the Latino population is less disapproving than the general population. Among that group, almost two-thirds (64%) feel that the failures of the Bush administration outweigh any accomplishments, while 24% say the opposite (Pew Research Center for the People & the Press, December 2008). Some of the biggest differences in perspectives on the Bush administration relate to educational levels. Hispanics with less than a college degree are less likely to assess the Bush legacy positively than are better educated Latinos. Half (50%) of people with no high school diploma, and 59% of people with only a high school diploma, think the Bush administration will be remembered more for its failures than for its accomplishments, compared with 42% of Latinos who have college degrees or more. Conversely, 17% of those lacking a high school diploma, 18% of those with only a high school diploma and 34% of college graduates believe that Bush will be remembered more for his accomplishments. As expected, political party affiliation is strongly associated with assessments of the Bush administration. Even so, Latinos who say they identify with the Republican Party4 are far from united in their perspective on George W. Bush. Almost one-in-four (39%) Latino Republicans believe that Bush’s failures will outweigh his accomplishments, while 44% say the opposite. Among Latino Democrats, 70% believe that his failures will outweigh any accomplishments, while 15% believe that Bush’s accomplishments will prevail. Evaluations offered by Latino independents are less lopsided, though still negative—49% argue that history will most remember the failures of the administration, and 18% believe history will most remember its successes.